This is the story behind my Guinness World Record™ for the Furthest golf ball blow. Admittedly, I've got a few odd habits. One of these is my fascination for blowing items to see what they do: feathers, flies and peanuts as well as grass seeds, plastic wrappers and my favourite – golf balls. Fancy that, since I couldn't hit a golf ball in the normal way if I tried. I did once try, actually, and bent the golf club. The ball didn't move. I gave up playing golf. But I didn't lose my interest in the little coloured bouncing balls. To this day, they remain a great favourite of mine. When I say they're a passion, what I mean is I'd go the extra mile to play with a golf ball, and for a world record, I'd go as far as it takes. In fact, I remained still; the ball was the one that went as far as I could take it. I blew it. I'd been central to arranging a series of world records for a charity. One of the ones it was decided I'd try was to blow a golf ball further than anybody else alive. Gee, that was a tall order, I responded, but I was eager nevertheless. I agreed and began planning. Once I'd had time to study the rules, I needed to tick various things off my list of preparations. I was looking forward to this, as I always do when the prospect of another world record comes along. The two most time-consuming arrangements I needed to see to were finding the right golf ball, and making sure I could access a suitable venue. I had underestimated the time needed to do both, and it surprised me. The right type of golf ball? Yes, the rules stated that not any ball would do; I needed to check with the golfing world about makes and the details of how the balls were authenticated. In the process I learned an awful lot about golf which I suspect many casual golfers themselves mightn't know. I felt like a school child on a research assignment. It was interesting. The other critical thing I needed was to make sure I had the correct venue pre-arranged. Ideally, I wanted to be able to walk in, set up, attempt the world record, conduct my admin and leave. But do you think it was easy. No. I asked and checked and visited several places until it was decided with the charity that I'd approach the local train station. The what? Then I agreed. From then on, planning was simple: I got their permission for which I was awfully grateful. The big day was full of activity. 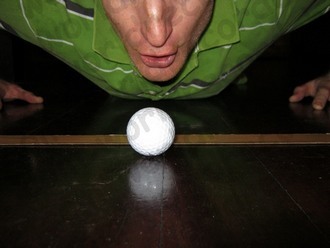 In addition to other world record attempts I was involved with, I had to blow the golf ball in my pocket. That, friends, was to be the highlight of my day, believe it or not. My passion for golf balls was about to be seen. At least with sites such as 3ball.com, there are a range of the right sort of golf balls and other equipment used and new to help! When it came time to devote myself to my little white ball, all else in my life faded into insignificance. I clutched it tightly, as one would hug a friend departing on a dangerous journey. Good luck! I told the ball under my breath. Those involved gestured to me which direction they thought I ought to blow in, and I lined up various landmarks to work out the best path for my treasured golf ball. I could do this. I could send the ball beyond the obstacles which, under normal circumstances, would be seen as anything but: chairs, railings, pillars and skirting boards. I placed people at equal distances along the line we all expected the ball to follow. Next, I began breathing exercises. I was going to have to produce the biggest breath of all if this ball was to move even the slightest distance. But I knew that once it gained momentum, the effort I spent blowing at first would carry the ball along. I was ready. Like a huge lazy animal, I collapsed to the floor without any concern about who was watching. Curiously some passers-by watched, but I was too focused to pay them any attention. I raised my torso up on my forearms to inhale, then rested and waited. After repeating this several times, I sank to the walking surface for the last time. Down there, where innumerable people tread, I pursed my lips into a tight funnel like a chimpanzee expressing itself. My eyes were so close to the ball, I could see wisps of weightless dust adhering to it. That dust, I thought, was about to go for an unusual ride – if it survived the blast of air that was about to be pressed out of my lungs. With every iota of strength I could muster, I blew into the back of the golf ball until my mind went blank. The ball wobbled, a sign that I took to say “You can't do this, so go and get a real job!” That was enough to trigger my utmost determination. I placed the ball where it had been and I breathed in with purpose. At speed, out came all the air my lungs could hold. It struck the ball squarely and, after an instant of no action, the little fellow took off. That's what I wanted to see. Or was it? The ball veered left, straight into a pillar at high speed. I watched in disbelief at it bounced with a click and came rushing back to me. Wrong way! Reaching forward, I snatched it. My helpers weren't impressed. I would do it again, and this time, I told myself, I'd do this well. But no. My breath wasn't powerful enough to do what my mind was visualising. The ball rolled only a few centimetres and stopped abruptly. I grabbed it, feeling a twinge of irritation. The next blow was the best and the ball rolled away to a natural standstill. That was wonderful to see, and my witnesses agreed. I was drowsy from all the blowing, but could still complete the admin. Within minutes it was over but a sense of nagging was growing in my mind. I had to return; I had to. And I did. The second time, I surpassed my wildest expectations and knew it was what I deserved.